Birmingham and London 1906 antique superb solid silver Edwardian very large complete and original fitted travelling vanity set by EDWARDS AND SONS, in original leather case. Birmingham and London 1906 Edwardian English hallmarked solid silver complete travelling vanity service in original aubergine Moroccan fitted leather case with aubergine silk lining, all by Edwards and Sons, of Regent Street, London, royal warrant holders for King Edward VII. Made for a Mrs. Bertram Barton, this complete service has survived in wonderful condition due to being preserved inside the canvas exterior travel cover. This service contains everything that would have been indispensable both at home, and on travels. It is the antique equivalent of the essential carry on case of today, with additional room in the case for jewellery, a change of clothes and reading material. It comprises more than 40 original pieces: a leather cased large manicure set, silver folding knife, ivory paper knife, several other leather pieces including a fitted velvet lined jewellery case, sketchbook, leather and glass inkwell, vesta case, pin cushion, card case (still with Mrs. Bertram's calling cards) and sewing kit. In addition, there are 28 silver items including: a cut glass and silver topped spirit flask, with removable silver cup: 2 cut glass silver topped scent bottles: large silver spirit burner with holders and leather cased steel ivory handled curling tongs: 2 hair brushes, 2 clothes brushes, 1 hand mirror, glove stretchers, button hook, and shoe horn, a Goliath clock in a silver easel backed case, 6 additional silver and glass toilet bottles and pots, and unusually a matching London 1906 large silver tray by famous maker William Comyns, which weighs 375 grams alone! All silver is beautifully engraved with garlands and ribbons, and presented in the lovely fitted case, also marked Edwards and Sons, with silver plated clasps. Also included is the original canvas weather proof cover. Size of case-18 inches wide by 14 inches deep by 7 inches high. Edwards and Sons goods were of such high quality that Harrods bought all their stock in the 1920's. This is a sumptuous antique service, rare in its size, condition, and completeness. The condition is very good, with just some very slight bruises to the silver tops of two of the bottles, and some denting to the top edge of the hand mirror. The rest of the items and all the glass are in excellent condition. This is a very rare and striking extremely collectable antique set to use or display, and is in overall very good antique condition. London 1910, solid silver rare original and complete travelling vanity or dressing case by famous maker MAPPIN AND WEBB, in fitted leather case or box. London 1910, English hallmarked solid silver rare original and complete travelling vanity set in its lovely dark green Moroccan leather fitted case lined with aubergine moire silk, by very famous makers Mappin and Webb. The silver as well as the case bear the Mappin and Webb makers marks. This service contains everything that would have been indispensable for the period, both at home, and on travels. 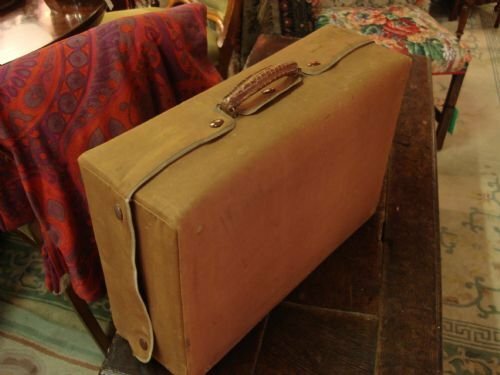 It is the antique equivalent of the essential carry on case of today, with additional room in the case for jewellery, clothes and reading material. All the fittings slot tightly into their own compartments in the lid and sides, leaving the centre empty for additional travel necessities. The fittings comprise: 10 solid silver pieces as well as a silver handled manicure set. They include 2 silver topped cut glass scent bottles, cut with panels to the body and faceted shoulders; 1 silver topped soap jar and 2 other sizes and shapes of silver topped cut glass toilet bottles, also panel cut; a silver hair brush, silver clothes brush, silver and tortoise shell comb with leather sleeve, a silver handled shoe horn, a silver handled button hook, and a leather cased silver handled manicure set. In addition, there is a leather cased folding bevelled mirror, and a leather cased sketch/note book. Even the brush bristles appear to have had little use. All the silver is engraved with a beautiful foliate and scroll design including quivers of arrows. They are not monogrammed. Size of case-16.25 inches wide by 13 inches deep by 7.75 inches high. The outside of the green leather case has the initials of the original owner embossed in gilt letters, "J.C.T," near handle. The case is marked in gilt with the makers mark Mappin and Webb, Oxford Street, London surmounted by a gilt crown. This set is complete, including even the two original keys and their little leather holding case! A rare thing to find, in very good condition overall, with just a few minor marks to some silver pieces, and made by an excellent and very well regarded maker. Normally, when these are found, the cases are in poor condition, and looted of the valuable inner contents. This one is complete, lovely with minimal wear inside and out, and a great value. If one wishes, the silver contents could be removed to be used on a dressing table separately, while the case could be used as a stylish and generous antique suitcase on its own. A wonderful thing for the collector of silver and antique boxes/cases, with lovely items to use and display on the dressing table. 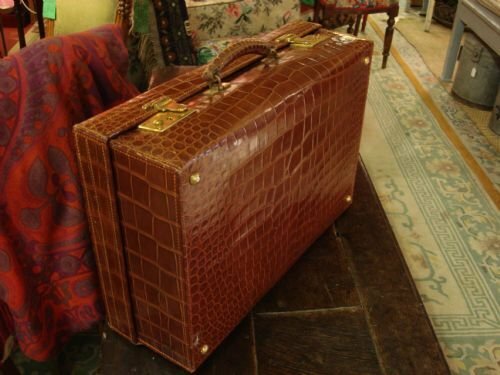 Wonderful quality early 20th century vintage crocodile suitcase including the original canvas cover, made by Whitmore's Makers of Birmingham. This piece of luggage is in wonderful condition, as it has always been covered with the original exterior canvas travel cover that was always provided with the finest quality luggage. To be absolutely critical, there is just very slight lifting to the lower corners of one end of the crocodile skin handle, just where it comes in contact with the metal swivel. All leather is still there and can be refixed with glue. Nothing is missing. 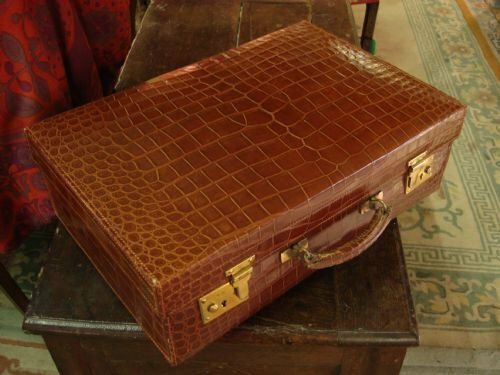 The cognac colour and patination of the crocodile skin is magnificent, as the canvas cover has both protected it and gently polished it all these years. The skin is beautifully patterned and matched, and well sewn. The gilt makers mark and address is visible on the leading edge above the handle when the case is opened. 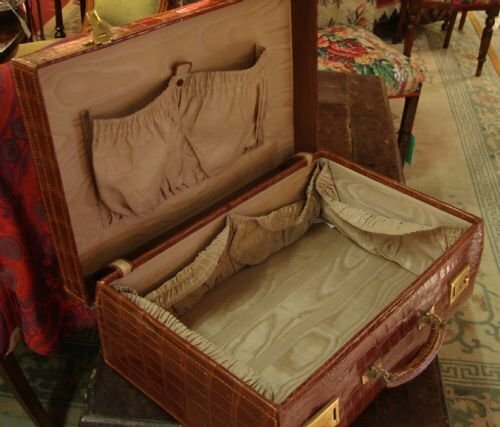 The interior is a cream coloured moire silk with several storage pouches in lid and sides. The fittings are polished brass and include four feet on both bottom and bottom side, so that the skin is always protected whether the case stands upright or lying flat. The canvas cover is tightly fitted, and has interior leather reinforcements in the areas where the brass feet would touch the canvas, a touch found on the finest luggage. All canvas closures are operable. The brass catches with original gilding are fully working, operating by pushing the button to the side which releases the latch. The original key is not present. Size-approximately 20 inches long by 13.5 inches wide by 6.5 inches deep. 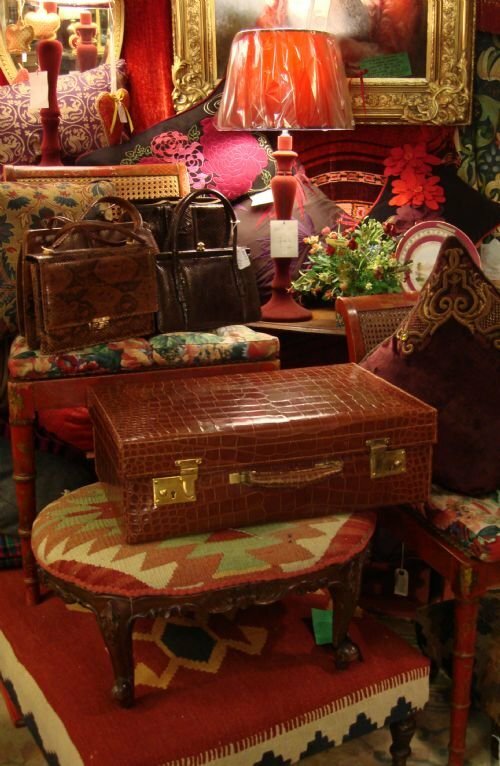 A wonderful fine quality piece of vintage crocodile luggage, in very good condition to use or display as a fabulous decorative piece. Additional photos can be emailed as desired. Shipping available to qualifying countries. Please email margi@serpentineinternational.com directly to enquire.